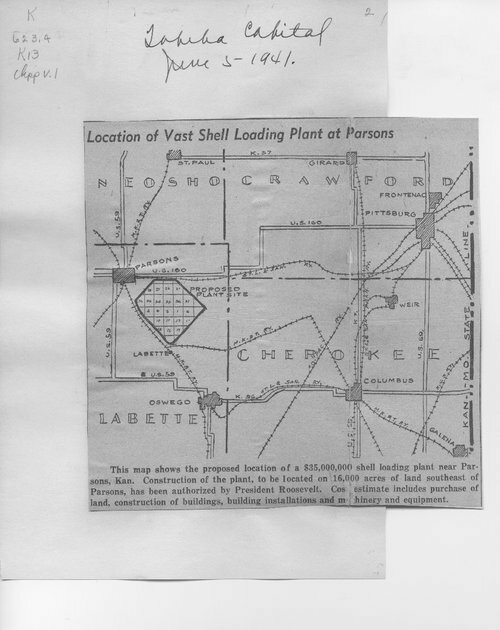 This map from the Topeka Daily Capital, shows the size and location of the proposed site for the $35,000,000 shell loading plant that was built near Parsons, Kansas in the early years of World War II. Authorized by President Roosevelt in 1941, the Parsons plant occupied over 16,000 acres of land that had previously been used primarily for farming. This item can be used in conjunction with other items on the home front during World War II to provide students with an understanding of the scale of the effort on the home front during the conflict.